238 Jenkins Mill Drive Westminster, SC. | MLS# 20210305 | Lake Hartwell real estate homes and lots for sale. Real estate agents offering expert knowledge of Lake Hartwell. Licensed in both South Carolina and Georgia to sell Lake Hartwell Property. Anderson, Clemson, Lavonia, Hartwell, Seneca, Toccoa, Martin. Wonderfully crafted cedar lodge situated on one+ acre with great water in a beautiful setting. 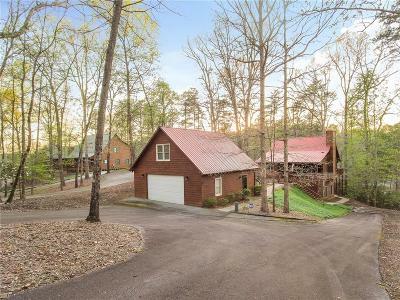 Home features wood floors, lakeside master bedroom, vaulted ceiling great room with fireplace, rec room, secluded loft for kids or storage, screen porch, large deck, metal roof and covered front porch. The detached garage offers a finished living area upstairs with a full bathroom and enough space for several beds and a tv area - perfect for guest! The covered slip dock includes a boat lift, PWC float, storage locker and a light pole/power outlets at the shoreline. This desirable community is comprised of well maintained rustic waterfront homes, a common area with fire pit and benches, neighborhood boat/trailer parking area. Must see to appreciate the full setting. Convenient to Toccoa GA, Seneca, Westminster and Clemson!